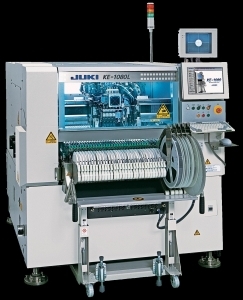 Juki Automation Systems Europe, a provider of automated assembly products and systems, will showcase its latest assembly systems at the upcoming SMT/HYBRID/PACKAGING, taking place from May 3rd to 5th 2011 in Nuremberg, Germany. JUKI’s FX-3 high-speed chip shooter and KE-3020 high-speed flexible mounter will be on display. With the possibility of mixing the new electronic feeders with the existing market proven mechanical feeders and an E- model board size of up to 610 x 560 mm the FX-3 and KE-3020 are ideal for the production of PC Notebooks, Flat Screen TVs and a wide range of consumer and automotive electronics. JUKI’s KE-2070 high-speed chip shooter is designed for contract manufacturers and OEMs that value flexibility, quality, ease of use and reliability. The KE-2070 on display will be equipped with the EPV placement monitoring system allowing root cause failure analysis directly on the machine by attaching newly developed, ultra-small cameras directly to the machine placement head; imaging and storage of the pickup and placement of each component can be carried out in real-time. Built on the same design as the KE-2070 is the KE-2080 high-speed modular mounter which, in addition to the six nozzles LNC60 laser head, is also equipped with an extra high precision vision head. With the flexibility to place from 01005 through to CSP and odd formed parts, these machines feature quick and easy change over that leads to extremely high-uptime, yielding the lowest cost of ownership. The KE-2080 on display will be fully equipped with JUKI’s intelligent feeder systems; IFS-X2 and traceability. The machine will also be equipped with a fluxer unit for PoP placement, as well as the options for placement force control and split recognition. JUKI’s IFS-X2 intelligent feeder systems platform uses a patented, contactless, RFID smart feeder technology that is upgradeable and maintenance free. The feeder intelligence is accessible on and off of the placement machine, on offline trolleys, as well as feeder storage carts. Intelligent feeders provide additional functionality to simplify offline feeder setup, verify component placement, and record traceability data. JUKI’s IFS-X2 system sets the standard for ease of use and flexibility. Using RFID technology, IFS-X2 provides graphically aided offline setup, real-time monitoring, data collection during production and critical traceability data. JUKI will host demonstrations of live LED placement using the JX-100LED high-speed compact mounter. The new low-cost compact entry level placement machine with a rated IPC9850 speed of 15,300 cph featuring superior cost performance, versatility, reliable quality and ease of operation is perfectly suited for the low cost LED placement. The standard JX-100LED supports board sizes from 50 × 50 mm up to 800 × 360 mm and can be extended optional up to a board length of 1200 mm. On display for the very first time in Europe will be the new KE-1080 high-speed flexible mounter equipped with a TR-6 matrix tray changer (in-line type). The KE-1080 and KE-1070 are built using the same topology as the popular KE-2080 and KE-2070 Flexlinepremium machines that show tremendous success in the marketplace. The two machines replace the popular KE-2060light and KE-2050light machines and represent new the Flexlinelight product line. These machines stand out due to a very interesting ratio of investment versus performance. The KE-1080, with an IPC9850 rated speed of 14,100 CPH for chips features a four-nozzle LNC60 laser head plus an extra high precision vision head. The component range for the KE-1080 is 01005 to 74 x 74 mm or 50 x 150 mm. During SMT Nuremberg, visitors to JUKI Booth 7-333 can see a range of machines offering live demonstrations of demo and speed board placement with a starting component size of 01005. There will also be a software station demonstrating the functions of JUKI’s intelligent feeder system, IFS-X2, and intelligent shop floor solutions, IS as well as other software tools. IS, intelligent shop floor solutions, represents a modular server client line management software that includes functions such as multiple users, multiple lines, integrated intelligent feeder and traceability. The software raises production preparation, scheduling, quality and monitoring to a new level by bringing several related functions together into one comprehensive software package. IS gives managers, supervisors, and engineers the tools they need to run the most efficient production possible, thus reducing cost and improving productivity. Various tools allow workers at different levels to perform the tasks they need within a single software package. Juki Automation Systems Europe splits its product portfolio in four flexible, modular and fully cross compatible product lines, providing Lowest Cost of Ownership solutions for every customer. The Flexlinelight is favourably priced, but still provides high flexibility together with the renowned JUKI quality. The Flexlinecompact offers high flexibility and is characterised by its superior cost performance. It generates maximum return against minimum investment. These compact machines are quick to install and easy to operate. The Flexlinepremium delivers premium flexibility. The mounters in the Flexlinepremium range give the highest flexibility as well as allowing the mounting of a wide range of components. Flexlinevelocity offers flexible high speed. The Flexlinevelocity models focus on accurate, high performance mounting.